Food has a special place in my heart when it comes to traveling. Not only because it can be delicious, but because it’s one of the greatest ways to immerse ourselves into another culture. Food takes up such a large portion of every culture around the world that there is always something new to learn from heading out and trying the local delicacies wherever you may be. And you never know when you might come across your new favorite food! Some of our very best cultural experiences happened while sitting on a rickety plastic chair in some hole in the wall, where all we can do is guess what it is we’re ordering off an incomprehensible menu. Not to mention all the mouthwatering meals that accompanied them along the way. For those who don’t know, Pad Thai is stir-fry dish made with rice noodles, shrimp, chicken, or tofu, peanuts, a scrambled egg and bean sprouts. The ingredients are sautéed together in a wok and tossed in a delicious Pad Thai sauce. It’s common street food in Thailand and one of the most popular dishes at Thai restaurants around the world. After traveling all over Thailand for years and eating Pad Thai wherever I could get my hands on it, I can honestly say some of the best I’ve ever found was in Bangkok. You’ll have the best luck walking along and near the famous Khao San road. There are people all throughout the area whipping up delicious Pad Thai constantly. 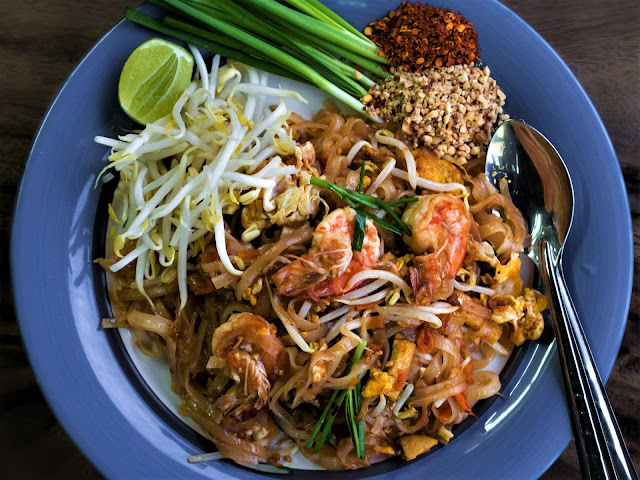 It may be the wild tourist street we’ve all heard about, but it's also where you can find some the best street Pad Thai in the country. If you want to avoid the chaos try walking around some of the other streets in the area or maybe booking a Bangkok food tour would work better for you. Thai Basil Stir Fry is a must try for those looking for an authentic Thai meal. 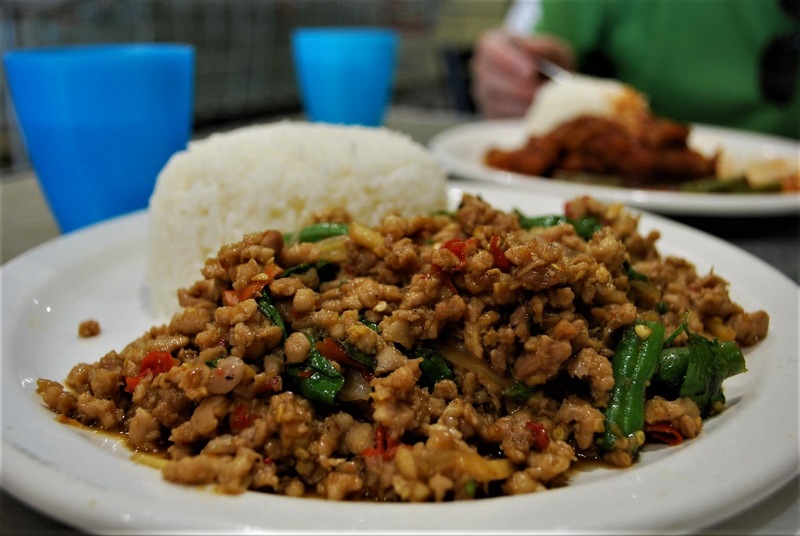 This meal is prepared by stir-frying minced pork or chicken, Thai holy basil, various spices, and vegetables together in a wok. It's traditionally served over rice and topped off with a fried egg. The holy basil, garlic, and bird's eye chili pack this dish full of flavor while also giving a bit of a kick. You'll have no trouble finding this dish in almost any local restaurant on the side of the road. Thai basil Stir Fry is one of the most incredible foods to try in Bangkok. And a great way to experience it and all the others on this list is to simply go for a walk and stop at the most local restaurants you can find. Or ask some locals where they love to eat. You’ll find that almost anyone would great you with a smile and be happy to point you in the right direction! 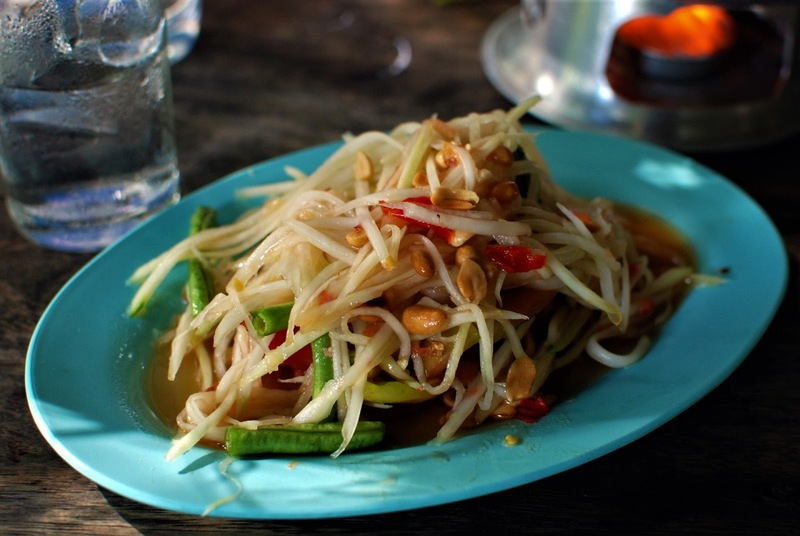 Papaya Salad is another famous dish that you can’t miss on your trip to Thailand. It combines the five main flavors of all the local cuisine: sour lime, hot chili, salty, savory fish sauce, and sweetness. The ingredients are mixed or more appropriately, (pounded) together with shredded green papaya in a mortar. You would find papaya salad all around Southeast Asia, but the style that became popular worldwide is made with peanuts and comes from central Thailand. Due to its popularity, Som Tam Thai can be found all over the city. I quick google search can help you find the most popular places to find it. Although famous for its delicious savory dishes, Thailand desserts are perhaps not so well thought of. However, the simple but delicious Mango Sticky Rice is one of the most, if not the most popular Thai desserts. It’s traditionally made with glutinous rice (or “sticky rice”), fresh mango and coconut milk mixed with palm sugar. This is the perfect dish for all the mango lovers out there! You can find Mango Sticky Rice all over the city, but some of the best can be found by taking a walk along Sukhumvit Soi 38. 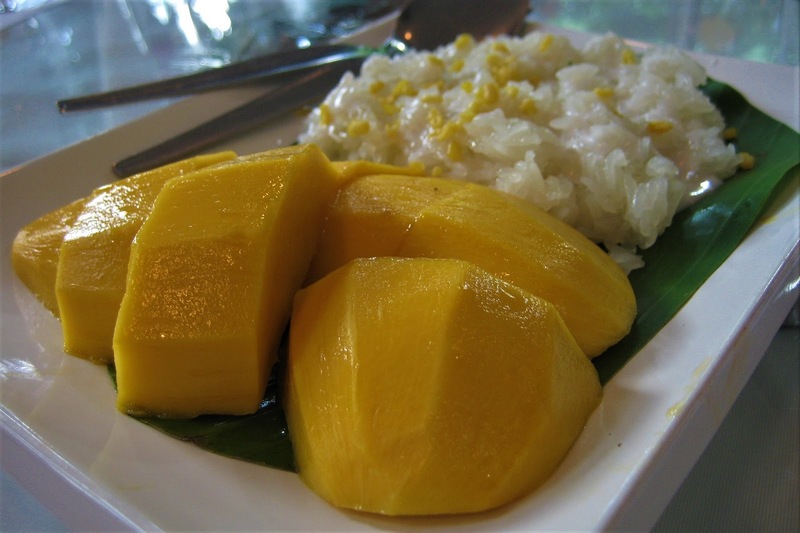 You will have no difficulty finding the dish, as mangoes are almost always in season in Thailand. The best time for mangoes, however, is from March to July. Okay so Thai Iced Tea may be more of a drink than food, but it happens to be an amazing refreshment when exploring the city on a hot day. Which in Thailand, is pretty much every day! It's most commonly made with a strong tea that is mixed with sugar, condensed cream and topped off with just a little more cream for good measure. 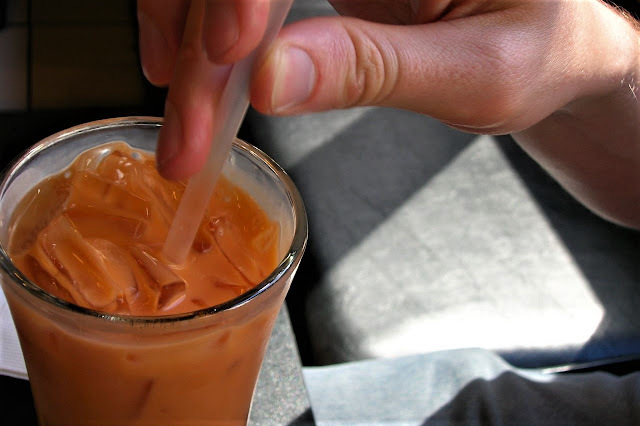 Thai Iced Tea might be too sweet for some people, but whether or not you have a sweet tooth, it’s well worth joining in with the locals and giving this a try. Thai Iced Tea can be found pretty much anywhere that serves beverages. As well as various street carts around the city. On a side note, BUGS! Although it’s not on our main list, insects still have a place here. Some bugs are considered delicacies in Thailand after all. And while it may not be the most desirable of things to eat, it’s certainly an experience. 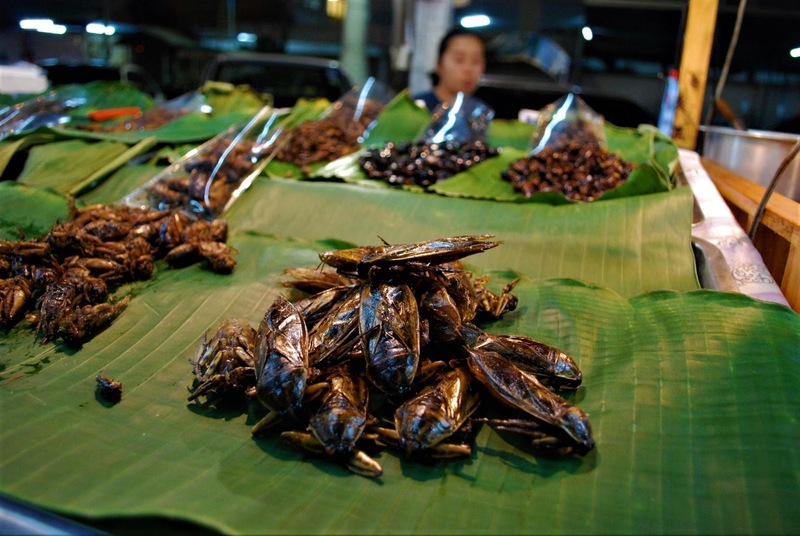 If you're looking to tick “eating bugs” off your bucket list, Bangkok is a great place to do it. There are all kinds of fried bugs that are sold in the city, ranging from fried crickets to giant scorpions! I can’t promise it will be the most pleasant experience, but it’s worth a try if you happen to walk by some fired bugs stands along Khao San road. Thailand is a magical place full of delicious experiences waiting to happen! 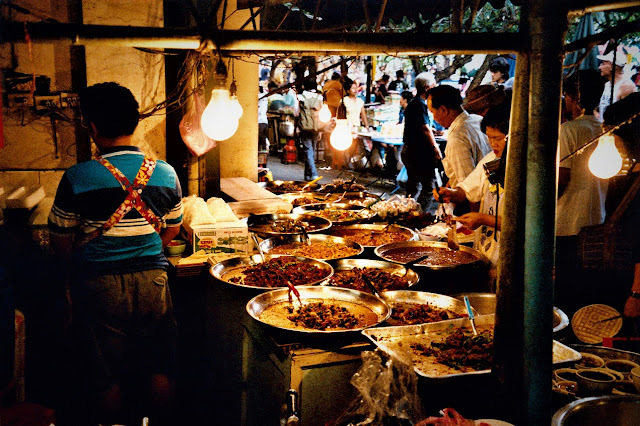 I hope you enjoyed our list of the top 5 incredible foods to try in Bangkok. Let us know in the comments below what your favorite Thai dish is!